Flowers bring visual beauty, beneficial bugs, and extra revenue to a farm—what’s not to love? 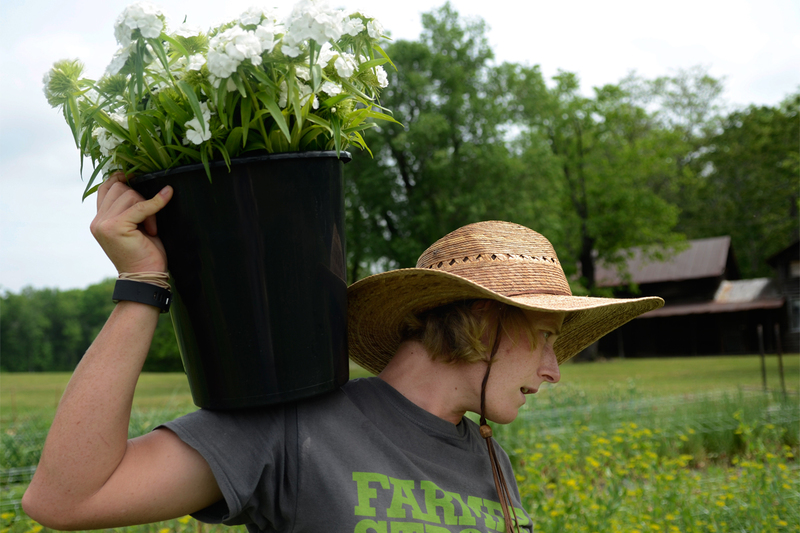 On a former tobacco farm near North Carolina’s bustling Research Triangle, Jonathan Leiss and Megan Cornett Leiss are harvesting small white flowers in preparation for Mother’s Day. The flowers, called Sweet Williams, have been pre-sold to florists in Durham. The couple moves quickly down the row, clipping stems and bunching them together with rubber bands before placing them into plastic buckets of water. The couple has been growing flowers on Spring Forth Farm since 2014. Until December 2016, they lived in a tiny trailer with their pit bull mix while building their house. “We wanted to have a homestead and grow our own food, so we wanted to find a business that could support that lifestyle,” Leiss said. Growing and selling cut flowers worked as a solution in two ways. Selling the flowers provides income, while having the flowers among their kale and garlic helps keep away pests and attract pollinators. The couple doesn’t generally sell all the food they grow. Instead, they eat it, trade with neighbors, and donate some of to their local food pantry. Spring Forth is one of many farms that are reaping the benefits of flowers—as a way to boost a farm’s bottom line as well as its ecosystem. And, unlike with many food crops, growers are finding a market that’s ready to pay the true cost of growing them in a sustainable way. Until 1991, domestically grown flowers made up nearly 65 percent of the country’s sales. When the United States entered into the Andean Trade Preference Agreement (ATPA), part of the “war on drugs,” tariffs on a number of products from Bolivia, Colombia, Ecuador, and Peru were eliminated to incentivize growing crops like flowers instead of coca. Since then, the percentage of flowers grown in the United States has steadily decreased, supplanted by sales of South American flowers, the majority of which come from Colombia. Roughly 80 percent of flowers sold in America are imported. These imported flowers are grown by underpaid laborers using heavy doses of synthetic pesticides, and carry a large carbon footprint given the many hundreds of miles each shipment must travel. Against this backdrop, U.S. growers have carved out a niche for sustainable, local flowers, and they’re finding that it is often more profitable than growing vegetables alone. In 2014, a U.S. Department of Agriculture report found flowers to be among the most profitable crops for farms with 10 or fewer acres with annual sales between $10,000-$500,000. The local growers who sell to florists generally do not receive a premium compared to the imported blossoms, but they are able to grow certain flowers that don’t travel well, such as dahlias. And the farmers who sell at farmers’ markets or have community-supported agriculture subscriptions (CSAs) are able to set their own prices. Spring Forth Farm sells three CSA sessions during the growing season, offering one flower drop per week for five weeks at a cost of $75 a session or $200 for all three. Mockler decided to get into flower farming after a year of living paycheck to paycheck, taking odd jobs like construction or scraping mold. With a Master’s degree in environmental studies and a background working on farms, she knew she wanted to work within local agriculture. When she lucked into a piece of land, she chose to focus on financial stability, and flowers because they’ve been shown to be more profitable by acre for small farms. “People won’t actually pay for the true value of food—they don’t understand why they have to pay four dollars for broccoli,” she said. But, she added, flowers are seen as a luxury item, so can command higher price tags. Ziegler comes from a vegetable-farming background and began by dabbling in flowers, adding a row here and there among her pesticide-free beans and tomatoes. She now only sells flowers, although she continues to grow food to eat and trade with neighbors. Rather than branding all insects bad for the farm, growers like Leiss and Ziegler differentiate between “good” and “bad” insects. While some insects eat food crops, others eat those destructive insects. By maintaining a balance of the two, pest problems in gardens and on farms can often be kept at an acceptable level. But when there is a lack of crop diversity, pests can get out of hand. If you only ever plant a few kinds of crops over and over, the same pests will keep coming back, and you’re less likely to find other insects on the farm that can keep their population in check. On the other hand, rotating in different kinds of crops and intercropping flowers with vegetables bring a lot of beneficial insects. “Each year, our pest problems are either lessened or on a sustained level that is easily managed,” said Amy Hicks, owner of Amy’s Garden, a certified organic vegetable and flower farm in Charles City, Virginia. Hicks’s farm currently sells roughly 25-35 percent flowers and 65-75 percent vegetables. She grows on 12 acres, two of which are designated for flowers. She credits the farm’s healthy honeybee population to this mix. Indeed, science supports her theory. A 2013 French study found that bees fed with a variety of pollen types, as opposed to with pollen from a single flower, had better odds of survival. Like produce, direct sales have proven an effective way to get local flowers to consumers, and CSAs are a popular way to sell flowers. Mockler primarily sells through a CSA of 14 customers. Both the Gardener’s Workshop and Spring Forth Farm do a lot of their sales through flower subscriptions as opposed to selling at farmers’ markets; Ziegler’s Gardener’s Workshop has a 120-member flower share. Amy Hicks, on the other hand, does almost all Amy’s Garden sales through farmers’ markets. Over the last few years, consumers and growers have started to think about where our flowers come from. Slowly, the percentage of flowers being imported is falling. According to Ziegler, who is the mid-Atlantic director of the Association of Specialty Cut Flower Growers, membership in the association has been increasing. It was hovering at around 500 in 2011, but it hit 1,221 active members in 2017. Dole sees it as an offshoot of the slow food movement. As consumers began to think about where their food came from, they started to wonder about other agricultural products as well. Great article! Thanks for posting. Such an inspiring trend in farming--due the inspiring farmers themselves.